It might be said that a great man is indeed great if the lives of those around him would be different had he not lived. By this definition, William F. Buckley Jr. was a great man. Much has been said and written and no doubt much more will come—fitting tributes by his many admirers and friends, perhaps derision and scorn from his numerous philosophical opponents. But it might also be said that only truly great men have so many loyal friends and ardent enemies. Would we have had a Barry Goldwater, a Ronald Reagan, or the thriving and intelligent set of noble right-leaning minds of today had we not had a Buckley? Perhaps another intellectual godfather of the “Big C” Conservative movement would have stepped into the fore—and perhaps not. But for today, we hopefully lay politics, economics, and religion aside and remember the man himself. Astute and intelligent, urbane and erudite, brilliant in debate and discourse, and possessing of a complex and extensive vocabulary for which he is well known. In fact, his command of the English language and lexicon were sufficient to send the most learned grammarian scurrying for an unabridged dictionary—one that Mr. Buckley himself might have edited. He also possessed a unique accent—often humorously imitated—that many thought affected. Rather, it was due to spending his formative years in Mexico City (his father was stationed there) and learning native Spanish—a language he adored his entire life—then French as a second language before attending school in England where he learned British English as his third. Cap this off with the distinct lingual influence of University at Ivy-league Yale and life in Connecticut…there you have it. But though certainly not affected, that unique accent proved effective in probative interviews and scintillating debates on his long-running “Firing Line” television show and upon the world stage. He authored literally dozens of influential books—fiction, non-fiction, and instructional—and thousands of articles. We remember his ardent defense of Catholicism, his National Review magazine, the thousands of television appearances, his ever-present humor and willingness to laugh, the political candidacy and activism, military service and brief employment with the CIA, accomplished musicianship (harpsichord and piano)…this is an interesting life not done justice here. Many of us were secretly concerned for Bill Buckley after the death of his loving wife and life-long partner Patricia last year. Their love and affection for each other was clearly profound and respectful. Buckley’s health had suffered over these last years and devoted souls are made more fragile when the object of devotion is lost. They are joined now in the heaven of their life-long Roman Catholic faith—and Saint Peter himself best mind his questioning at the gates. 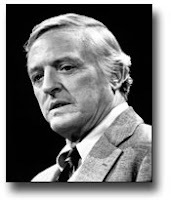 William F. Buckley Jr., died on February 27, 2008, at age 82. He is survived by his prominent son Christopher, his extended family, and a very long list of colleagues and admirers. RIP.